The company evaluated many options including proprietary offerings from large established vendors and Do it Yourself (DIY) approaches deployed by hyperscale companies. 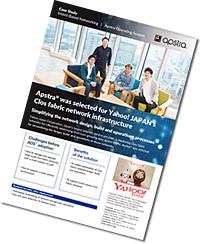 This case study addresses how the company applied the same design, software, hardware and chip principles and selections as a hyperscale provider, but selected Apstra for automation software. "There is no real alternative to AOS in the market."